On April 4, we fight for equality, we fight for fair pay, and we fight for The Dream. Nearly 50 years ago, Dr. Martin Luther King Jr. was assassinated while standing with striking sanitation workers in Memphis fighting for The Dream of fair pay and racial justice. Today, we are still fighting and have faced widespread illegal surveillance and intimidation to stifle worker protest from the Memphis Police and McDonald’s. On April 4, we’re carrying on that dream – because economic and racial justice are two sides of the same coin. You can’t have one without the other. That’s why the Fight for $15, and the Movement for Black Lives, America’s two most powerful social movements, are joining together in resistance and protest. As Dr. King said, “white supremacy and corporate greed have always been linked in America,” and right now Republican leaders across the country are pushing radical laws to crack down on protest movements. 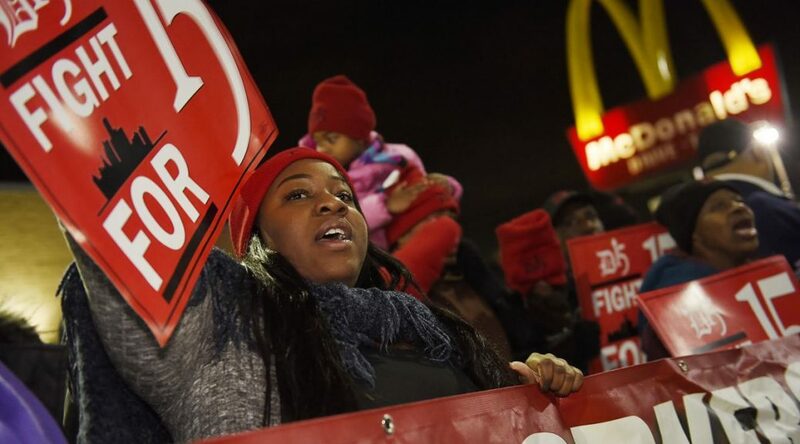 They’re working to block cities from raising wages. They’re trying to tear up the Voting Rights Act and keep us from the polls while they demonize and deport our neighbors. Now, more than ever, we have to band together as a movement for fair pay, as a movement for black lives, as a movement for immigrant rights, and as a movement – above all – for justice. Sign up now to join the moment of silence. If you live near a protest, we will send you the details so you can join in person, too.